I learned how to make pineapple cookies for the first time in my home economics class. I think I was in the eighth grade at the time. I must tell you that I thought this class was very boring. Mom started teaching me to cook at a very early age so making things like hot chocolate was a waste of time to me. Our hot chocolate was made with water so I was really not impressed at all. I am happy to say when we started “cookie baking” my whole idea of this class changed. Learning how to make pineapple cookies was truly an experience for me. I do not remember having pineapple around our house at all except an occasional can of chunks in Dad’s fruit salad. I certainly had never baked with it before. I fell in love with the flavor of pineapple and these “heavenly” pineapple cookies. They had such a great pineapple flavor! I must tell you that after I started making this recipe at home, I have never reached that same distinct flavor. I used the same recipe and the same brand of pineapple but never the same taste. I think it must have been due to the “first time taste experience” or something like that. Since I have learned how to make pineapple cookies like the ones from school, I have learned many others. They can be made as drop cookies, rolled, shaped, filled or cookie bars. Although most cookies are made with canned pineapple, they can also be made with dried pineapple or fresh. Usually when using fresh pineapple, it will need to be cooked first. Most recipes are made with crushed canned pineapple but sometimes you might use small pieces or “tidbits”. Sometimes if I am out of crushed pineapple, I will crush the canned slices, chunks or tidbits. If you are learning how to make pineapple cookies with drained pineapple, save the juice when draining. Often you will be instructed to use some of the juice in the recipe but if not, save it to use in other recipes that you are cooking. There is also a pineapple flavoring which you can buy. 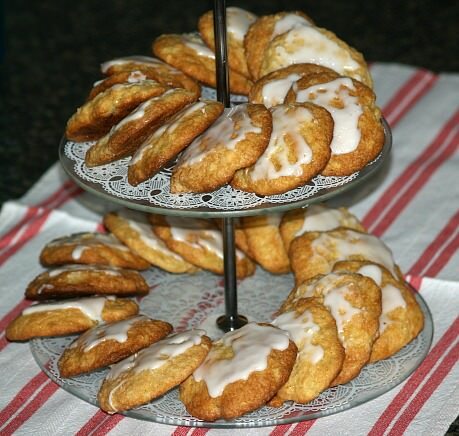 I do not think any of my pineapple cookies have it listed as an ingredient but I am thinking about trying a little in my old pineapple cookie recipe. Learn how to make pineapple cookies that are made with delicious sour cream. Combine in mixing bowl the sugar, shortening, sour cream, vanilla, egg and pineapple; blend well. Combine flour, baking soda and salt in a small bowl, blend into the shortening mixture. Drop by teaspoonfuls onto ungreased cookie sheets about 2 inches apart. Bake about 8 to 10 minutes until lightly browned. Immediately remove from cookie sheets; frost with icing. COMBINE all ingredients and mix to spreading consistency. Learn how to make pineapple cookies with apricots. In a large bowl combine shortening and butter; cut in flour and salt. In a small bowl combine yeast with sour cream and egg yolks; mix well. Add yeast mixture to the crumb mixture; mix well. Work into smooth dough; chill for 3 hours or overnight. Combine pineapple, apricots and sugar in a saucepan. Cook pineapple mixture over medium until thickened stirring frequently; set aside to cool. Roll dough on a surface covered lightly with powdered sugar tom about 1/8 inch thickness. Cut dough into 3 inch squares; spoon filling onto centers of squares. Fold up corners of squares to enclose filling; pinch edges to seal. Place on cookie sheets; bake about 12 minutes until golden brown. Learn how to make pineapple cookies made with delicious coconut. Cream together sugars, butter, shortening, egg and vanilla until light and fluffy. Combine flour, salt, soda and ginger; add to creamy mixture and blend well. Stir coconut, crushed pineapple and nuts into mixture. Drop by teaspoonfuls onto lightly greased cookie sheets; bake 8 to 10 minutes. Cool about 1 minute and remove to rack; makes about 40 cookies. Combine filling ingredients in saucepan; cook until thickened and set aside to cool. Combine ingredients for cookie dough; blend well until smooth. Rough dough out on lightly floured surface to about 1/8 inch thickness. Cut into rounds with cookie cutter; place a small amount of filling in center of round. Place another round on top of filling; press around the edge with a fork to seal. Place cookies on lightly greased cookie sheets; bake 8 to 10 minutes until set. TO MAKE CRUMB MIXTURE combine flour, oats, brown sugar and baking soda. Remove ½ cup of crumb mixture and blend in macadamia nuts; set aside for topping. Press remaining crumb mixture into bottom of a 9X9 inch square baking pan. TO MAKE FILLING combine 1 tablespoon sugar, cornstarch and water in saucepan. Cook and stir over medium until thickened and bubbly; stir in coconut. Spread filling over the crumb mixture in pan. Sprinkle reserved crumb nut mixture over the top pressing down lightly. Bake 30 to 35 minutes until top is golden brown. Place pan on rack to cool. TO MAKE ICING stir ingredients together in small bowl to drizzle consistency. 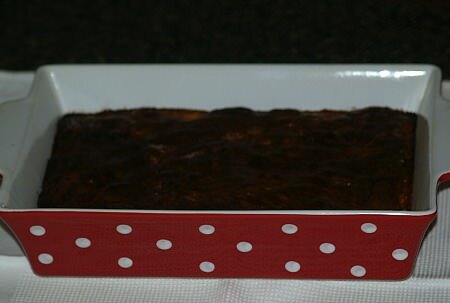 Drizzle icing over the top; cut into bars. Learn how to make pineapple cookies that are a rich brownie! Preheat oven to 375F degrees; grease a 13X9 inch cake baking pan. Combine and sift together the flour, baking powder, salt and cinnamon; set aside. Cream together in a large mixing bowl the butter and sugar. Add eggs to the creamed mixture beating well after each addition. Beat in vanilla; blend dry ingredients thoroughly into creamed mixture. Remove 1 cup of the batter and place in a small bowl; stir in pineapple and set aside. 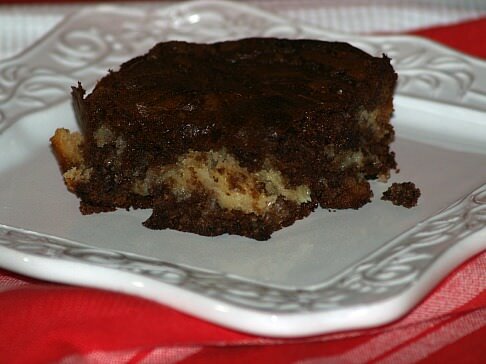 Melt chocolate and add with nuts into remaining batter. Spread chocolate batter into bottom of prepared baking pan. Top chocolate batter with the pineapple batter spreading to cover. Bake 35 to 40 minutes; set on rack to cool completely and cut into bars. Learn how to make pineapple cookies with cherries baked in bars. Preheat oven to 350F degrees; grease 13X9 inch baking pan. TO MAKE FILLING combine in small saucepan sugar, cornstarch, drained pineapple, cherries and 3 tablespoons juice. Cook mixture over medium heat stirring constantly until thickened and clear; cool. TO MAKE CRUMB MIXTURE in large bowl combine crumbled pie crust sticks and rolled oats. Add to the bowl brown sugar and 3 tablespoons of juice; blend to coarse crumbs. Remove 1 cup of crumb mixture reserving for topping. Press remaining crumb mixture in bottom of prepared pan; spread filling over crust. Add nuts to the reserved crumb mixture; sprinkle over the filling. Bake for 30 to 35 minutes or until golden brown; cool completely. Sift together flour and baking soda in a bowl; stir in corn flakes and set aside. Cream butter with sugars; add flour mixture, vanilla and pineapple juice. Blend mixture well and shape into 1 inch balls; place 2 inches apart on cookie sheet. Make an indentation in each ball with thumb; fill with pineapple and sprinkle nuts on top. Bake for 18 minutes; cool on rack completely. 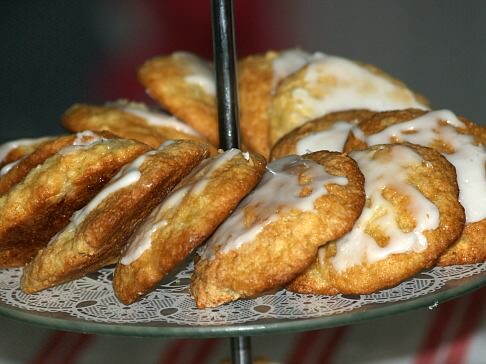 Learn how to make pineapple cookies with added flavors of coconut and orange. Set aside 1 cup of the flour. Combine remaining cookie ingredients; blend 2 minutes on low speed of mixer. By hand stir in reserved 1 cup of flour; drop by teaspoonfuls on prepared cookie sheets 2 inches apart. Combine topping ingredients and sprinkle over the cookies; bake 10 to 12 minutes until edges are lightly browned. Remove cookies from sheets immediately to rack to cool; makes 48 to 60 cookies. Learn how to make pineapple cookies made with date bread mix and cream cheese. Combine pineapple, butter and cream cheese in medium saucepan. Heat and stir pineapple mixture until butter and cream cheese melts. Stir remaining cookie ingredients into pineapple mixture just until well blended. Drop by rounded teaspoonfuls onto ungreased cookie sheets 2 inches apart. Bake 10 to 12 minutes until golden brown; cool completely. Blend frosting ingredients until smooth and frost cookies; makes 48 to 60 cookies.